With Wimbledon just around the corner, we're serving you a mandala crochet along to make this delectable strawberries and cream themed picnic blanket. For this CAL you will need Stylecraft Special Aran (100% acrylic). 2 x 100g (196 m) balls of Stylecraft Special Aran (100% acrylic) Pistachio (1822) and 1 ball in each of Raspberry (1023) and Cream (1005). This CAL is crocheted on a 5.5mm hook. A game of mixed doubles and trebles, the Wimbledon Picnic Blanket CAL starts on Friday 23 June and runs for 4 weeks, taking you right up to Wimbledon fever in time to lay down your throw on Murray Mount. We can't wait to see all your progress pictures and we're here to provide expert advice if you need a helping hand. Keep an eye on our Facebook page for all the news on when to get going. Whether tennis is your game or not, we're sure you'll love this blanket as much as we do. Made using Stylecraft Special Aran in zingy summer shades, the openings in the mandala pattern not only make it a speedy make, but super stylish at the same time. 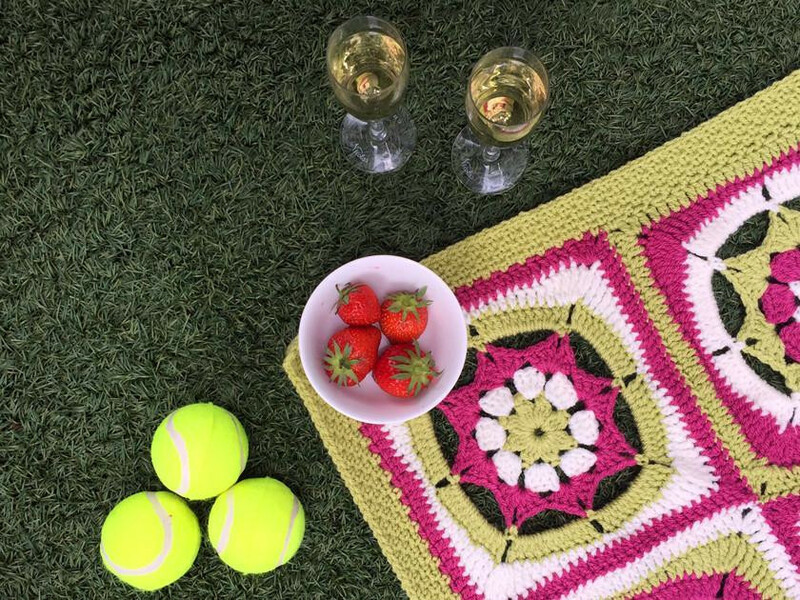 When the sun comes out, take a seat on your new Wimbledon Picnic Blanket with a cheeky glass of something fizzy to toast your crochet success when the four weeks of fun are over. This CAL is worked slightly different to our previous two, with each square having the same pattern. Join us as we invite you to work outwards on all the squares each week, so each mandala becomes larger until on the third week, they blossom into squares. Mandalas have rapidly grown in popularity in the crochet world for the enjoyable process of creating them. Many find them completely addictive to crochet, and we know you will too. If our fabulous Wimbledon Picnic Blanket CAL has got you gagging for more mesmerizing circular crochet projects, why not adorn your home this summer with a couple of psychedelic hanging ornaments? Download your Dreamcatcher Crochet Pattern and get going today. Win £100 to Spend on Yarn!